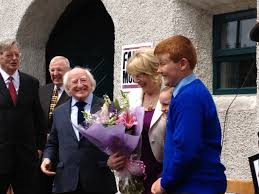 During the National Famine walk in 2017, Ireland’s President Michael D. Higgins greeted the walkers and joined them as they set off from Clondra and the commemorative ceremony for the 200th anniversary of the founding of the Royal Canal. 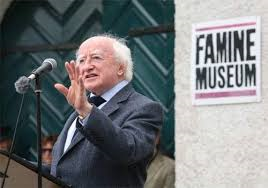 It was also inspired by Jim’s daughter, Caroilin Callery and Maggie Gallagher’s Strokestown-Quebec Youth Connection project that established an arts based cultural exchange between Strokestown and communities in Quebec where orphans from the area had been adopted. 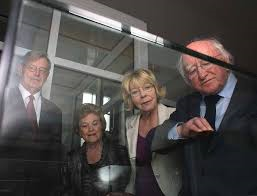 Between 2010 and 2012, the project encouraged young people in Ireland and Quebec to learn more about the traumatic historical experiences of their ancestors by teaching them how to research and trace cultural and familial associations between County Roscommon and places in Canada where the descendants of Irish Famine migrants are still living today. It brought together young people from the Strokestown area with students from Laval Liberty High School in Montreal through a variety of multimedia workshops in areas such as film, cinematography, theatre, movement, writing, art, music and historical research techniques. RTÉ’s Nationwide featured an episode on the “Strokestown-Quebec Youth Connection” project that can be viewed above.